These "Vegas Style" Plastic Jumbo Slide Under Drink Holders with Cutouts simply slide under a table's padded armrest. The lip at the bottom of each cup holder allows them to slide under the rail of a table for a secure place to rest your drink. 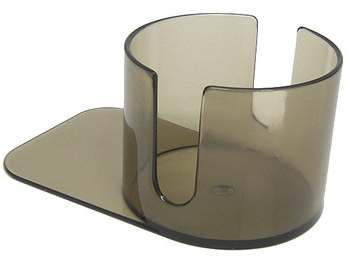 With cutouts on the sides these holders will accommodate almost any type of cup or mug and their smoke color is sure to compliment your decor. Additionally, these slide under cup holders will work standalone - even without tucking them under anything. These jumbo cup holders fit almost any sized drink and have a cutout on 2 sides that allow for any type of cup with a handle. The inside diameter measures 3.50 inches by 2.75 inches deep.